Before I get started, I want to emphasise that this article in no way attempts to be critical of all of those who exhibit / sell at Bridal shows, those who attend Bridal shows or for that matter, of those who organize and produce those shows. I have done them. Big ones and small ones. I do not especially enjoy them and will likely never do any more of them. The concept seems simple enough. All your wedding vendors in one place for hundreds of Brides-to-be to meet and greet. The reality IMHO is something different. I would compare some of the Bridal shows I have experienced to a cattle drive. Once the Brides get in, there is virtually no way out, except through the gauntlet of wedding vendors. I have been involved with shows as one of many DJ companies, each competing for the attention of the brides as they pass by. Many vendors (not just the DJ’s) are extremely aggressive in their approach. I have seen vendors actually block the aisle, not allowing Brides and their entourage to pass until they have listed to a sales spiel. The goal of many of these vendors is to book as many weddings as possible. I know of some DJ companies for example, who routinely book as many as a dozen weddings on a given saturday. Who cares how they do it, as long as they get someone to sign their contract. The more they book, the higher the profit… that is what a business is all about… isn’t it? Not exactly. Not all companies have that attitude. Some passively sit back and allow those who are interested to approach them but these are the exception rather than the rule. Please don’t get the idea that I am indicting everyone who markets themselves at Bridal shows. Many of my friends and colleagues routinely do these shows and do a great job when they are hired but how is an unsuspecting B2B supposed to know which companies are the quality ones and which are the shady operators? 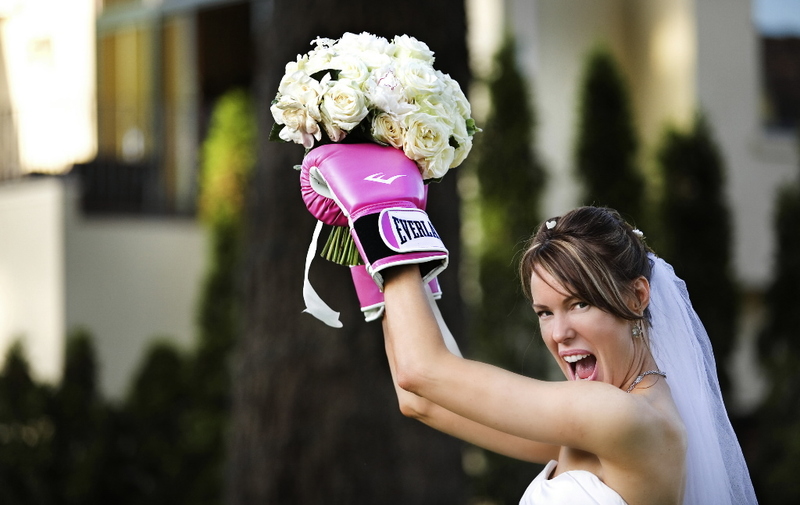 Bridal Fairs can be fun for a soon-to-be bride with the right attitude. Walk around, pick up some information, laugh at the obnoxious DJ’s who are screaming at them from the stage as they “emcee” the event, Watch a fashion show, sample some cake and maybe score some free prizes. It’s a good thing, as long as they have a realistic idea of what to expect and not allow themselves to be overwhelmed by the onslaught of high pressure salespeople fighting over their business and attention. You can tell which Brides are attending their first Bridal show. By the time they reach the end of the first aisle, they go into a “don’t make eye contact with anyone” mode and begin to plan a safe and quick exit. What they don’t know is that they really haven’t escaped because the avalanche of sales calls is about to begin as soon as the vendors get the phone lists from the promoters. I personally don’t do these shows anymore for two primary reasons. 1. The High Pressure vendors take the fun out of it for everyone, and 2. There is almost no chance of being able to have any meaningful conversations with anyone who may be a prospective client. Being a small company with an emphasis on personal contact and service, these big, impersonal shows simply do not allow an opportunity for anything more than a rehearsed 30 second “commercial” . I can’t and won’t operate that way. Our emphasis is “quality” over “quantity’ regarding our services and in the clients we serve. I am more interested in meeting with more discriminating clients who are looking for a higher level of service than the “cookie cutter” suppliers who frequent these shows can provide. Bridal shows serve a purpose for some. Thanks anyway… but I’ll pass.